Author: Murray, John A. Set In . . . Description: "The spell of Alaska," Ella Higginson wrote in 1908, "falls upon every lover of beauty who has voyaged along those far northern snow-pearled shores...or who has drifted down the mighty rivers of the interior which flow, bell-toned and lonely, to the sea....No writer has ever described Alaska; no one writer ever will; but each must do his share, according to the spell that the country casts upon him." 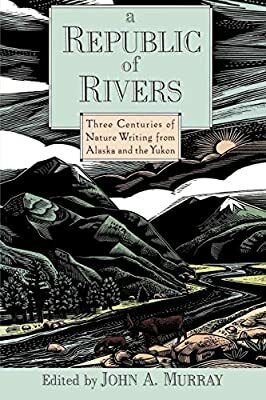 In A Republic of Rivers, John Murray offers the first comprehensive anthology of nature writing in Alaska and the Yukon, ranging from 1741 to the present. Many of the writers found here are major figures--John Muir, Jack London, Annie Dillard, Barry Lopez, and Edward Abbey--but we also discover the voices of missionaries, explorers, mountain-climbers, Native Americans, miners, scientists, backpackers, and fishermen, each trying to capture something of the beauty of this still pristine land, to render in their own words the spell that the country casts upon them. The range of viewpoints is remarkable. With Annie Dillard we look out at ice floes near the remote Barter Island and see "what newborn babies must see: nothing but senseless variations of light on the retinas." With Frederick Litke we mourn the senseless slaughter of sea mammals. We join scientist Adolph Murie, the father of wolf ecology, as he probes the daily life of an East Fork wolf pack. And we listen as Tlingit Indian Johnny Jack relates the difficulty of maintaining a dignified life close to nature at a time of cultural upheaval for his people. Most of these selections have never appeared in any anthology and some entries--particularly those written by early American and Russian explorers--have never been available to general readers. There is laughter here and there is sorrow, but finally there is communion and liberation as generation after generation encounter the unsurpassed beauty and wildness of the Arctic. Taken together, these forty-nine men and women provide a unique portrait of America's final frontier.